This form is the read only counterpart of the Data Entry Form available in Editable Mode. 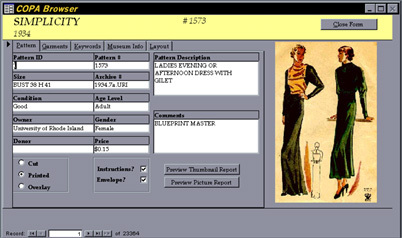 You can view all of the available information on a pattern, as well as print the information in either a Thumbnail or Record report format, however, as the name implies, changes to the records are not allowed. The Browser Form replaces the Search Form once the user has started a records search, displaying all those records which match the search criteria. The Browser Form can also be reached directly from the Read Only main form if the user would like to view all records without searching.